Most schools today, both public and private have kindergartens. They have become an accepted part of educational life in this country and others as well. This was not always so. When I first attended public school, way back in the mid-1940s, there was no kindergarten where I went. Although some schools undoubtedly had them, all schools did not. They had not become totally entrenched, although their promoters had been working on that project with much zeal. Their efforts seem to have paid off. Kindergarten is now as much a part of school life as the seventh grade. I have, in the past, written articles and even a couple booklets, dealing with the origins of public, or government, schools in this country. These “institutions of learning” have a history that is never quite openly discussed in all of its ramifications. We often see the names of founders and promoters of public education mentioned in articles or essays, but we are seldom told all that much about these people and what they really believed. Most educators don’t want us to go there. We are told that Horace Mann, the “father of the common schools” was among the most zealous of their earliest promoters and we are told about how hard Mann labored to make sure there was compulsory attendance for public schools because he was so concerned about the lack of education. We are told of Robert Owen, a “philosopher and pedagogue” who promoted public education. This is usually all most sources tell us about these men. They never really tell us why they did what they did. We are not supposed to ask. Thus, most folks never find out that Horace Mann was a Unitarian who denied the deity or lordship of Jesus Christ, a man who hated the influence that Calvinist church schools had in New England so much that he sought to come up with another system of education that would negate what the church schools taught. Most are never informed, regarding Robert Owen, that the “philosopher and pedagogue” was a socialist and atheist who did not believe that man’s original sin caused man’s problems, but rather, man’s problems were the fault of his environment. Thus, if you could just provide the right educational environment, via a public school, that would take care of everything. So Unitarians and socialists worked hand-in-glove to promote public education and to denigrate Christian education and schools. And, unfortunately, the Christians bought it. Now, regarding kindergartens, http://en.wikipedia.org informs us that Elizabeth Peabody, in 1860, founded the first English-language kindergarten in America, after she visited Watertown, Wisconsin. What this source neglects to mention is that Elizabeth Peabody was Unitarian Horace Mann’s sister-in-law. Why did Ms. Peabody visit Watertown, Wisconsin before starting her kindergarten you may wonder? She went there because the first kindergarten in the country was founded there by Margarethe Meyer-Schurz in 1856. The kindergarten classes in Watertown were conducted in German, but Ms. Schurz’s sister had also founded the first kindergarten in London, England. If the name Schurz sounds familiar to some of my readers, it should. You see, Margarethe Schurz was the wife of Carl Schurz, one of those socialist revolutionaries that came to this country after the socialist revolts in Europe in 1848 failed. You can read about her husband, Carl, in more depth in the book Lincoln’s Marxists (Pelican Publishing) that Donnie Kennedy and I co-authored. Mr. Schurz was one of the most prominent of the “forty-eighters” who came to this country after their attempts to install socialism in Europe failed. They came here to accomplish what they had failed to do in Europe. Before his illustrious career was over, Carl Schurz ended up becoming the Secretary of the Interior in the Hayes administration. As you can see, socialism pays in Amerika! Much of the impetus for the kindergarten movement came from Friedrich Froebel (1782-1852). R. J. Rushdoony, in his book The Messianic Character of American Education has said of Froebel that: “The fountain-head of all this, Friedrich Froebel, well before Darwin, not only held to cosmic evolution but saw education as a major element in that continuing process. For Froebel, the entire universe was a living, evolving organism, the unity of which is called God.” Now there’s a unique worldview for one of the main movers and shakers of the kindergarten movement–an evolutionist even before Darwin! The whole “evolving” universe is supposed to be God. You don’t suppose any of this sort of mindset ever seeped through to others, teachers or students, do you? Not surprisingly, the kindergarten movement in Europe became associated with the radical feminist groups who had their own ties to the 1848 socialist revolts in Europe. (See Addendum III, Socialist Influence on Feminism, on page 307 of Lincoln’s Marxists. With all the socialist baggage attending it, it should come as no surprise that, in Prussia, the government that put down the 1848 revolts issued an order in 1851 that banned all Froebel-inspired kindergartens. Karl von Raumer, the Prussian minister of culture and education condemned the kindergarten as “a center of atheistic and socialist subversion.” Gee, wonder where he ever got that idea! Other German states soon followed the Prussian example. 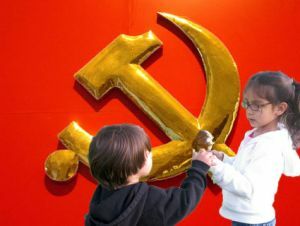 Seeing that they could no longer make a go of socialistic kindergartens in Germany, the “forty-eighters” brought them to America as part of their socialist agenda, and we eventually bought into them the same way be bought into the rest of the public school system. Don’t be surprised that your “history” books fail to mention most of this. You really are not supposed to know it, and our “educational leaders” would much rather you didn’t.